A root canal (AKA endodontic therapy) is a procedure meant to save a tooth that has become infected and if left untreated, would require extraction. There are many reasons a tooth can reach such a point. Sometimes something as simple as a crack or a chip allows decay inside the tooth. Sometimes extreme cases of decay leave the interior of the tooth incapable of repairing itself even with our intervention. Trauma to the tooth can damage it so badly that sometimes the only option is to perform a root canal or have the tooth extracted. At Middle Creek Dental we have performed thousands of root canals and are happy to help you keep your natural teeth. Root canals help to avoid extractions and prolong the life of your tooth. Why have a root canal done? The main reason to have a root canal done is that it will save your tooth. Losing a tooth can be extremely costly. At first glance, having a tooth extracted may seem like the least costly procedure – and in the short term, it is. The long term cost of losing a tooth is almost always much higher than simply having a root canal done. When you lose a tooth your jaw can experience significant bone loss. Your bite can change quite a bit with the loss of a tooth. Losing a tooth can set in motion a domino effect and the results can be quite expensive to fix. A tooth has multiple layers. On the outside a tooth is covered with enamel, behind that is a layer of dentin, and underneath the dentin is the pulp and the root. The pulp and the root comprises the living tissue within the tooth. We begin a root canal by preparing the tooth for the procedure. The tooth is prepped by placing a rubber sheet around it making it the only tooth we can see or access. This helps to protect the surrounding teeth during the procedure. Dr. Shaun Christensen then creates a hole in the top of the tooth to access the inner pulp and root of the tooth. We then remove the living tissues (root and pulp) as well as any decay or malady within or around the tooth. Once the living tissue has been removed from the tooth we use a cleaning solution to ensure that no bacteria is present within the tooth. We fill the void left by the removed pulp and root with a substance called gutta percha, which is a filler material that is inert. 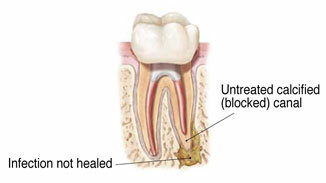 Once the root canal is finished we allow your tooth to heal for a time. After most root canal procedures, we usually recommend a crown be placed on the tooth. Once a tooth has had a root canal it is often slightly more fragile than a natural tooth. A crown can help to protect against chips and cracks. At Middle Creek Dental we care deeply for your health, and welcome you to give us a call today at (208) 505-9975 to schedule your no obligation consultation.